Akira Kurosawa’s 1990 film Dreams (Yume) is a collection of short segments, each depicting an individual dream. The first time I watched it, I fell asleep. It’s a remarkable depiction of what the experience of dreaming is like: slow-burning anxiety-driven plots that lack logic and occasionally escalate into nightmares, punctuated by moments of beauty and tranquility. That’s what dreams are like for me, anyway, and apparently Akira Kurosawa too. So much of the film is quietly horrific. A child having wronged the mystical foxes of the forest is given a knife and told to commit suicide–unless he journeys into the forest to apologize. Mountaineers caught in a storm are coerced by a demon to lie in the snow. Exploding nuclear plants cause Mount Fuji to glow like hot iron. And more. I’ve had these dreams, with different backdrops, with characters from my own life. Remarkably similar dreams, which is a testament to Kurosawa’s ability to articulate deeply abstract and distant ideas that lurk so far down in our unconscious psyches. One night in San Francisco there were fierce, cold winds, and I was living in an old building with original wooden window frames that let the cold air go wherever it damn well pleased. I slept in a sweater under a pile of blankets. But in a surreal moment of sleep paralysis, I awoke to something holding me down, accompanied by roaring, deafening winds. It was, it seemed, an evil presence in the form of the cold itself, pressing down on my chest–just as Kurosawa showed happening to the mountain climbers. I wonder if he experienced something similar and changed the setting to something logical for the story: a cold night in bed depicted as a blizzard on a mountainside. There are also those moments in your dreams that feel full of serenity and tranquility, when you are in a perfect place with perfect people. Perhaps the sun is pouring down, perhaps you are with someone you loved, maybe there’s a breeze and you watch the wild flowers sway back and forth. Kurosawa’s closing segment, a visit to a rustic village full of water wheels, feels like that. It was years ago that I watched it and fell asleep, but just the other day I awoke and was immediately reminded of the film by something I had dreamt. I can’t remember what it was. And yet–the thing is–I’ll have the same dream again and will revisit this film again, if only as an oddly reassuring reminder of our mutually shared dreams and nightmares. Let’s talk about WALL-E for a minute. The widely-praised Pixar film was released in 2008, and stars a little trash-compacting robot who is seemingly the last “living” thing on earth. The bot toils away at his job, collecting trash into towers of cubes in some futile effort to clean the planet for future generations, though humans are nowhere to be found. And then he meets the girl. That’s it, really, a little robot love story, and then other things happen. A lot people focused on the environmental allegory and its comment on consumerism, and that’s all there, but really it’s a small, sweet romance story more than anything. If anyone is the target audience of a Pixar robot romance adventure, it’s me. It me. I’m sort of a quiet, stubborn, perhaps nebbish loner by nature, and I’m also preoccupied with being industrious. So it’s little surprise that WALL-E, all alone on his planet (plus a friendly roach) and continuing his dutiful work was so appealing. I practically am WALL-E! Cube with tank treads is my beach bod. It actually makes sense as an autonomous trash-compactor, with its thick industrial metal painted yellow like a tractor, worn and faded at the edges from heavy labor. (Of course the hard-angled, brute force aspect of WALL-E acts a visual contrast to Eve’s more sophisticated and mysterious curved form–a blunt portrayal of masculinity and femininity.) And what makes it really work–what makes us care–are the large, expressive eyes. If I recall correctly, Stanton said it was a stroke of luck when he was watching one of this children play with binoculars at a baseball game. He noticed how expressive the center-pivot folding motion of binoculars can be. The first teaser (which was very inventive itself!) had me at hello. I mean, at “WaaaAAALL-E”. It’s just so charming, instantly. After the movie was released I wrote on my blogspot (lol) that it should be nominated for best picture. Not best animated picture, just plain ol’ best picture. It knocked the wind out of me at the time. But I needed something more than simply rewatching it. I needed a WALL-E to call my own. Luckily, Disney was quick to enterprise upon a movie that’s critical of consumption and there were a range of wonderful toys available when the film was released. At first I just indulged in a small 2-inch figure, but I soon returned to the toy store for something more substantial: a talking, animated toy. That particular WALL-E toy had rudimentary voice-activation; you could yell “HEY WALL-E!” and the little bot would frantically look around and wave his arms. There were even higher end models that could roam around on working treads, but I was sensible enough to obtain a more humble option. However! Seven years after the film’s release, there’s a new WALL-E on the block. More like… made of blocks. Angus MacLane is a LEGO aficionado who happens to also have been the directing animator on the movie. He tinkered with designing the robot in LEGO before the actual computer models were even finalized, and now almost a decade later, the LEGO kit has been made available through LEGO Ideas. Of course I bought one. It’s remarkably faithful to the actual design for something made entirely of LEGO bricks, complete with articulated arms and eyes, working plastic tank treads, and WALL-E’s front opening door. It’s a delight. I’ve never been a huge collector of LEGO, but I like the appeal of an adorable blocky thing constructed from an adorable blocky medium. There’s a refined, tactile quality that is more satisfying than a mass-produced plastic toy that’s soft around the edges. And assembling it was relaxing for its own reasons. Maybe when I’m a little older and crazier I’ll aim to recreate a “life-size” WALL-E like some industrious hobbyists have been making for years. Disney has one too–but they’re a little afraid of running over children’s toes with it, apparently. Until then, I’ll continue to populate my desk with toy robot knickknacks and occasionally use WALL-E as an online avatar. Because I am literally a small garbage tank with roaches for friends! Cross post from Kinja. Images by Disney Pixar and The Art of WALL-E. Sorry WordPress I’ve been busy on Kinja. Read my review of the Disney iOS alarm clock app, Wake Up With Disney. A loving tribute to Fitzcarraldo in cardboard. But wait! There’s more. Of course, I am also planning a Fitzcarraldo tribute in the form of a ship in a bottle, midway up the hill. I’m fairly happy with my ship that I designed in Autodesk 123D Design, but I haven’t considered the disassembly/reassembly aspect of getting in the bottle once printed. I’m considering making a tiny version in a Bulleit bourbon bottle, which has quite a nice shape (and taste, if you’re into that). Bulleit Fitzcarraldo would just be the miniscule Micro Machine version though, with the ship being maybe 2in long and less than 1in tall. Tales of the Gold Monkey is a pulp television series with the sensibility of a Saturday morning cartoon, following a cargo pilot’s adventures set in the 1930s South Pacific. If this sounds like the Disney show TaleSpin, that’s because Gold Monkey was a major influence upon the creator of TaleSpin, Jymn Magon. There are Nazis! Volcanos! Spies! Samurais! A dog with an eye patch! It must have been an expensive show to produce, and indeed it’s quite striking how much show there is. 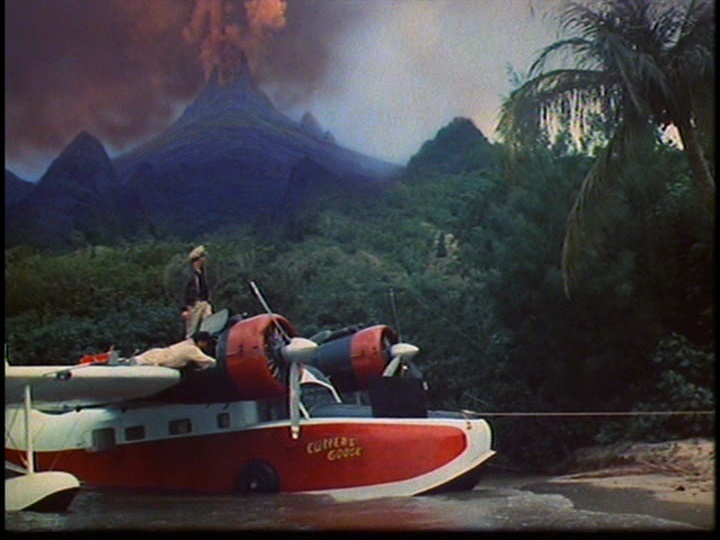 There are real vintage airplanes, aerial dogfights, large sets, and much of the series appears to be shot in Hawaii. In terms of production scale, this is the Game of Thrones of 1982. The series is the brainchild of Magnum PI creator Donald P. Bellisario. Many television shows that lasted one season or less have come and gone, but the most similar show that comes to mind is The Young Indiana Jones Chronicles. Young Indy was undoubtedly better produced, directed, and written, but also ten years later. Contemporaneous to Gold Monkey was Bring ‘Em Back Alive, another WWII-era adventure series set in Singapore. Both were criticized as Raiders of the Lost Ark knockoffs, but it would be more accurate to say that the popularity of Raiders is what allowed Gold Monkey and Bring ‘Em Back Alive to be greenlit during that television season. Bellisario was apparently working on the idea before Raiders was released. It’s great to see distributors like Netflix giving a second life to the many brief but wonderful television series that have hooked our sense of romance and adventure over the years. If you can still maintain your childlike sense of wonder, you’ll probably enjoy Tales of the Gold Monkey. It’s only available by disc over Netflix, or you can just buy whole the 21-episode run on Amazon for thirty bucks. Read a more thorough history of Gold Monkey, written by John K. Muir.